Our Sunday Worship Services begin at 8:00 am, 10:30 am, and 5:00 pm. 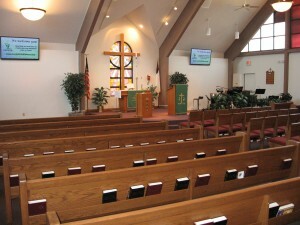 The 8:00 worship uses liturgies from the Lutheran Service Book. The 10:30 worship is a blended worship with worship team and contemporary music. The 5:00 worship uses the same format as the 10:30 worship. The Lord’s Supper is celebrated every Sunday at all worship times. A special children’s message for our young worshipers is included in each worship time. During the sermon in the 10:30 worship, our young worshipers have their own worship time in Children’s Church. A message from God’s Word is shared with the children through songs, activities, and a hands-on craft. At 9:15 we begin Christian Education. Sunday School is open to children ages three through high school. We encourage and invite you to bring your children to Sunday School. 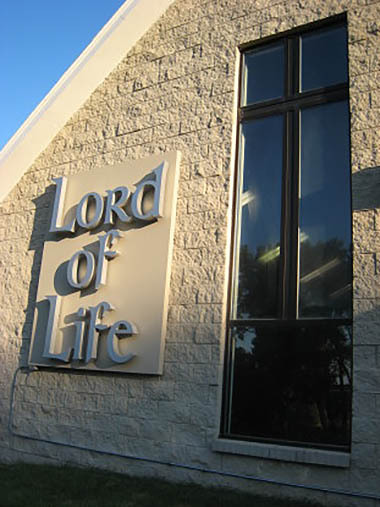 Adult Bible Studies meet in the Fellowship Hall and Gathering Area (narthex). Following each worship is a time of Fellowship with coffee, juice, and snacks. Please join us in this casual social time. During the seasons of Advent (the 4 weeks before Christmas) and Lent (the 7 weeks before Easter) we gather for worship on Wednesday evenings at 7:00 pm.